Enceladus Compared to the United Kingdom - Solar System Planets And Moons Section. 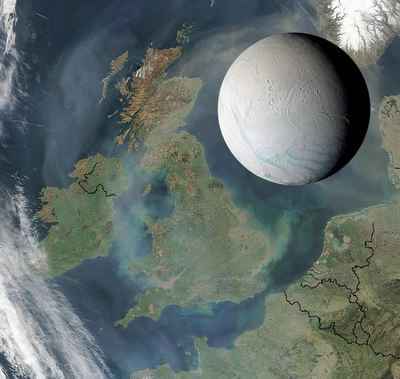 Enceladus Compared to the United Kingdom. Saturn's Moon Enceladus. Image credit: NASA/JPL/SSI. Here's a picture of Saturn's Moon Enceladus side by side with the United Kingdom, to show its actual size. Enceladus is only 505 km (314 miles) across, and it could comfortably fit within the states of Arizona or Colorado. Saturn's Moon Enceladus is only 505 kilometers (314 miles) across, small enough to fit within the length of the United Kingdom, as illustrated here. The intriguing icy Moon also could fit comfortably within the states of Arizona or Colorado.